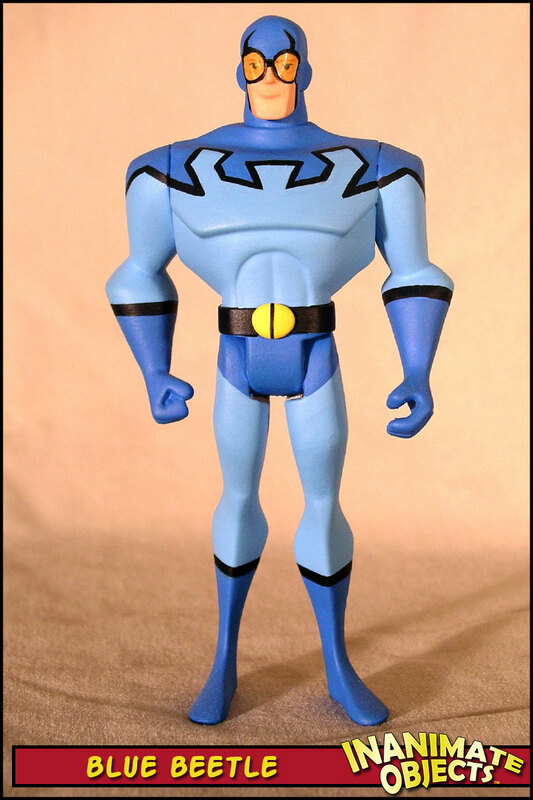 Sadly, Blue Beetle will never appear on Justice League Unlimited, or appear as a figure in the current line by Mattel due to rights issues. He can, however, appear in the JLU comic book. Go figure. Since that became public knowledge, a lot of excellent Blue Beetle customs have popped up. 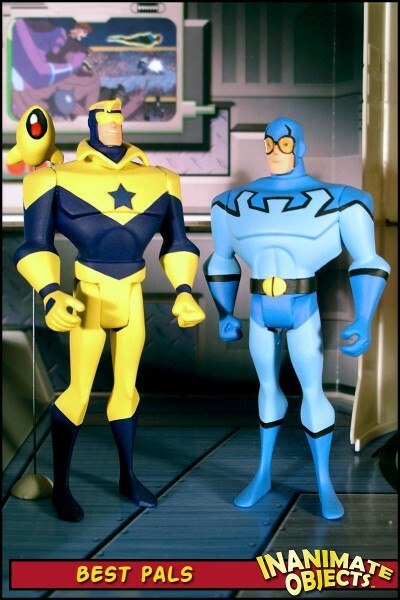 My favorite belongs to my pal Tyke, who in turn based his on the art of Carlos B., which is about as close to an “official” animated Blue Beetle look as we’re likely to see. 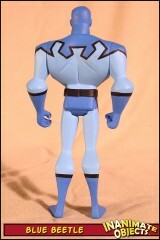 Like Tyke’s, mine is based on a Starman figure, both for the build of the body and the head (especially the ears). Starman’s crazy hair was removed. The belt is vinyl with a Kneadatite buckle. I tried something a little different with the goggles, as I wanted to see the eyes beneath. Using a leather puncher, I cut two tiny circles from yellow acetate. The problem was how to adhere them to the face. Normally I completely finish a figure before it gets a few layers of Dullcote. However, that would fog up the goggles. 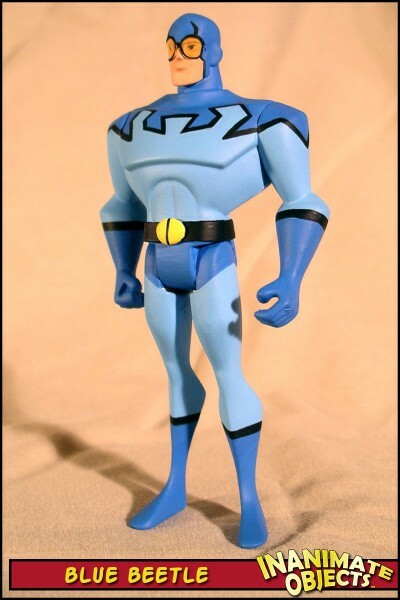 So I painted the body, and only painted the skin, eyes and blue of the head. After the Dullcote was applied, I superglued the yellow circles in place, then went back and added the black lines. Aside from the fact the yellow acetate looks orange over the flesh tones, I am very pleased with the final result. UPDATE: I’ve been receiving many compliments and questions as to how I painted Beetle and Booster’s lines so straight. Sadly, there is no secret. That’s simply the result of patience, practice and a steady hand. 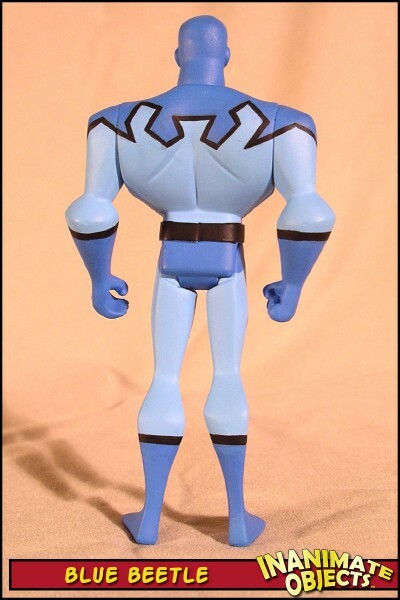 UPDATE 2: Mattel did finally release a Blue Beetle, and it’s pretty lousy. 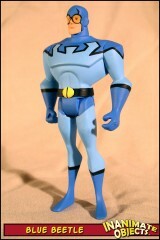 Mine trumps Mattel’s!